I mean, wow. I know I should start being a little more creative, based on what I’m about to say, but that’ll have to do. Last night, before going to bed, I decided to add my previous post to StumbleUpon. I’ve done that before with other pages, and got one or two hits before it disappeared into the murk depths of that behemoth collection of internet goodies. I love StumbleUpon, don’t get me wrong. It’s one of the best ways there is to kill a couple of hours, and there’s some really awesome stuff out there. I just hadn’t had much success with it as an agent for driving my own web traffic. Yeah, that’s just today. And better yet? At the moment, I’m sitting on 859. Now, I’m aware that StumbleUpon doesn’t give you a choice of what webpages it sends you to. Sure, you pick a couple of topics, but the whole premise is that it’s random. It’s not like 850 people decided to visit my website. 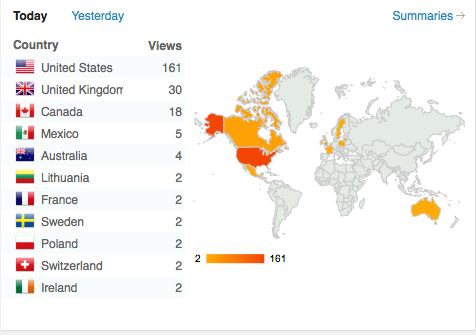 But…850 people visited my website. And a couple of them clicked around, and a few of them downloaded my story. And even though my stats are now totally screwed up forever, that’s kind of awesome. Plus I’ve got all these flags! You can’t tell me that’s not the most exciting part of looking at your Dashboard, guys. I was so psyched when they introduced that feature, because I am a dork. It’s as close to being an international jet-setter as I’m ever going to get, and I’m totally going to nerd out over it for a while, whether you like it or not. I have no idea if this is going to become a regular thing. I added a couple of other posts and pages, too, but they don’t seem to be having the same effect. But hey. I’m not complaining. So I’d like to give a big hello to anyone who decided to stick around after being forcibly manhandled into my little circus. Feel free to look around, criticize my DVD collection while I’m in the restroom, and make yourself feel at home. Also, if you’re from one of those lovely far-away places, leave a comment and say hi! OMG but I love the flags … and the map …! That’s awesome. I think I envy you. I got one from Iraq this morning. It just makes me wonder about all these people’s lives and the strange ways we intersect with each other. Wow, that’s some serious traffic. Like you, when I add a single follower, it’s a cause for celebration. My average daily traffic is about 40–and that’s up from about 30 a month ago. Yet another cause of major celebration. I use StumbleUpon, but haven’t thought about submitting some of my best posts. While there’s sure to be some element of random fluke involved, more likely than not, your new post got a bunch of hits because when people read it, they gave it a thumbs up, which made it go out to more people. So whatever you did, do it some more! I was awfully confused the other day because WordPress decided to add my FaceBook contacts as followers, which meant my total followers jumped up by around ten. And here I thought I was popular! Wow, that’s a lot of people from a lot of places. So cool. StumbleUpon can be really epic for your blog. I’ve gotten a good 2000+ hits in a day from StumbleUpon — though it was only once, and it totally screwed up my stats. Still worth the awesome feeling though. I’d never heard of that before. I’ll have to check it out. I, too, have had some strange places show up on my list of countries – Slovenia, Romania, Singapore… I wonder how they found me?